TELEFLEET is a web-based application giving real-time access to a wealth of information for fleet, vehicle, machine and field staff optimization and management . TELEFLEET can be used as a “coaching” tool to help achieve company objectives . 1. 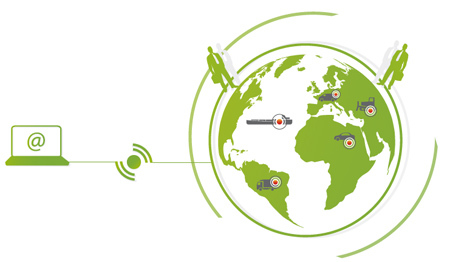 A web-based application: Users can access Telefleet from any PC connected to the Internet. As well as the basic functions, other functions specific to your sector can be added. Telefleet is also open to existing programmes in your company (ERP, CRM, specific applications) to which direct links can be created. 2. Telematic boxes: Onboard hardware that sends event information and the vehicle’s GPS position to the server by GPRS, SMS, satellite, or other means. Our range includes various boxes for motorized vehicles and non-motorized units (trailers, containers, etc.). 3. Communications screen optional: For communicating tasks or schedules of rounds, Garmin (or similar) GPS screens can be installed. 4. High added-value partners: Telefleet has a network of leading partners for advice, installation, and technical support. A major player in the efficient development of information technology,Market-IP is a supplier of applications and content in the field of locatio-based services. More information on the company and the services it offers at www.Market-IP.com.